The New NY Bridge project team is installing energy-efficient roadway lighting. This Earth Day, the New NY Bridge project is continuing its efforts on the crossing’s energy-efficient roadway lighting, which utilize light emitting diodes, or LEDs. The transition to LED technology is one of many endeavors brought to the forefront on Earth Day, and New York’s Earth Week, beginning April 22. The project’s LEDs, created by Philips Lighting, are designed with 100,000-hour lifespans, more than triple the lifespan of conventional lamps. The nationwide use of this technology could defer 246 million metric tons of carbon over the next several years, according to the United States Department of Energy. This would ultimately require less fossil fuel from power plants, reducing the country’s carbon emissions as well as an estimated 50 percent on energy costs – saving approximately $250 billion per year. The roadway lighting fixtures will include removable LED boards, allowing maintenance teams to quickly and easily replace the illuminations. 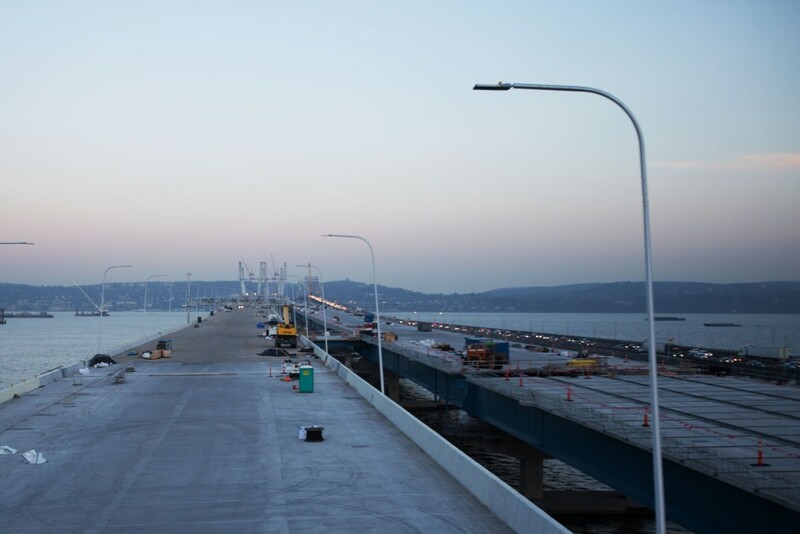 Other LEDs will also be used to illuminate the project’s concrete piers and the iconic, cable-stayed main span. All of the project’s LEDs contain zero levels of mercury, a typical component in fluorescent lamps. This makes the LED boards recyclable and less impactful on the environment. Other aspects of the project also aim to reduce environmental impacts, including the crossing’s cashless tolling system. The elimination of lengthy toll-collection lines reduces idle time for vehicles, which could improving traffic flow and air quality in the future. The U.S. has steadily reduced its energy consumption since the 1970s thanks to national policies and growing environmental awareness supported by Earth Day. During Earth Week, and throughout the year, New York State Thruway staff and maintenance crews will be undertaking a variety of activities along the roadside, including; wildflower and pollinator plantings, cleaning permanent stormwater controls, planting and repairing living snow fences, installing bird boxes, removing debris, and much more.